In comicbooks, heroes are the stars of the show, no doubt about it. There are hundreds of titles published every month, and they all favor the good guys. Sure, there are famous villains, but they just exist in the hero's book: it's very rare to have a villain as your headliner. The Joker is one of the few to ever get that honor, and his book only lasted nine issues. On the other hand, in the early '90s, Eclipso had his own ongoing series for three years. Long ago the Spectre defeated the Spirit of Wrath, exiling its physical manifestation to a black diamond called the Heart of Darkness. And so it remained until Dr. Bruce Gordon found a fragment - and was possessed by Eclipso, the Earthly incarnation of the Spirit of Wrath. During a lunar or solar eclipse, Gordon's alter ego would grant him superhuman strength, light-powers and use him in its ancient schemes for control over all mortal beings. Since then, Eclipso has possessed others, and is ever ready to tempt and corrupt both superhumans and ordinary people. It wasn't just a lunar or solar eclipse that turned Bruce into Eclipso: it also happened during an "artificial eclipse" - you know, like covering a lightbulb. Yeah. 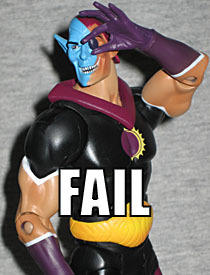 Fortunately, Eclipso could be banished by any bright light, making him the only villain in history who could be (and regularly was) defeated by a camera's flash. In 1992, DC decided to give Eclipso a major power upgrade, setting him at the center of their annual summer crossover, The Darkness Within. Suddenly there wasn't just one diamond, but 100 identical jems, and it specifically took sunlight to exorcise him - no more flashlights to the rescue. One of the revelations in the crossover was that Eclipso chose to dress like a supervillain to ensure everyone underestimated him. This figure (built on Mattel's standard "slender male" body) is dressed in the old-style costume, so obviously he's up to his old tricks again. His shirt and trunks are black, his leggings and collar are royal purple, and his boots and gloves are eggplant. His heavyweight world championship belt is pale yellow, with a darker shade airbrushed along the edges. His chest symbol - a penumbral view of the sun - is painted crisply, with pale yellow for the sun and royal purple for the "moon." 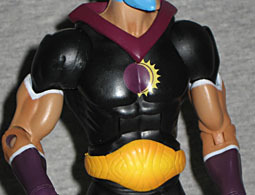 One feature of Eclipso's costume are white bands between the sections. Cleverly, the white for the sleeves is painted on the figure's biceps: that way, when you turn the arms, the lines move with them, and nothing ever looks "broken." The same can't quite be said for his ridiculous face. The sign of Eclipso's power is a blue circle covering half the face, so no question that's done here. The blue continues onto his neck, but obviously it has to stop at some point: they can't account for every possible pose. For whatever reason, the Four Horsemen opted to go with a weird, pixie-ish look that Eclipso has really never had. Yes, he has pointy elf ears, but they've always been more "Lord of the Rings" than "World of Warcraft." He also has an inhumanly twisted smile, sunken cheeks, and a chin that could cut diamonds. It's overdone, and it while it does make Eclipso stand out from the crowd, the exaggeration also hurts the figure overall. The weirdness draws attention to itself, rather than looking like an organic part of the design - at least in part because his body is as plain as everyone else's. Eclipso gets new hands, which is good. The right hand is open in a loose clutching pose, so it'll look natural hanging at his side or held up to gesture wildly. The left hand is gingerly pinching the black diamond between thumb and forefinger, with the other three fingers held out of the way. That one would be particularly great, if he had enough articulation to get the stone up to his eye (without nearly twisting his head off his shoulders). Yes, you can get them aligned so that they look right from one specific angle (the blue paint under his chin gives you a clue as to how to pose his head), but he uses the diamond by holding it right up to his face, not hovering near it. Still, it's a lot better than DC Direct's attempt, so we're still counting this one as a win. And hey, the neck balljoint works here, too, so again, that's one for the "plus" column. 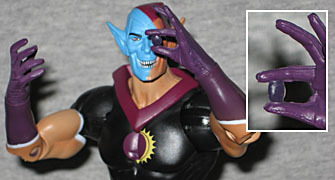 Eclipso has no accessories of his own, of course, because the only item he ever uses is a molded part of his hand. He does include a piece of the Series 12 BAF, Darkseid. It's the twin to the piece included with Iron: the right leg. Though it's only about half an inch bigger than Eclipso's own legs, you can certainly see this is going to be a much larger figure. The set also includes a DC 75th Anniversary collector pin, taking the cover from Justice League International #24. It's definitely an iconic image, and works great on a button, so it's already got a leg up on most of the releases (even if it is entirely unrelated to Eclipso). Considering the fact that the JLI was mostly second-stringers, it's impressive that Mattel has already released most of the ones seen here in the DCU line. Eclipso is a somewhat disappointing release. Even accepting that Mattel is never going to bring their elbow and knee joints up to modern standards, which would be required to let him use his diamond properly, the "large" body would have better suited the character, and his head is just wrong - no two ways about it. 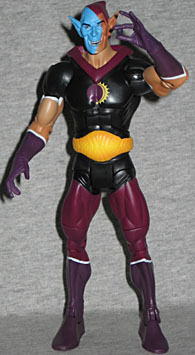 But all that said, Eclipso is an important DC villain, and this is easily the best toy of him there's ever been. Sure, it could be better, but that's no reason not to get him - it's not like we can expect an improved version down the line.